30 years ago, before the original Kamen Rider were created, Kadowaki Jun was supposed to be used as the original Kamen Rider, but Shocker's plans changed after Hongo escaped. Before he could be awaken, the double riders destroyed the Shocker base and the sleep capsule that Kadowaki was in was buried underneath the ruble of the Shocker base for 30 years. When he finally awakes in the present day, Kadowaki has no recollection of his life. The story follows his quest to regain his memory and figure out who turned him into a cyborg. 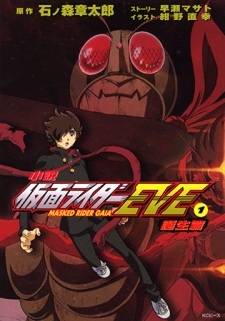 Kamen Rider Eve serves as a sequel to the original Kamen Rider manga. Rough plotting was done by Ishinomori some time before his death. The series was originally going to be published in place of Kamen Rider Spirits but was delayed due to certain circumstances.